I’ll let you in on a little secret: Halloween reminds me of my biggest weakness for my creative endeavors – creepy stuff. And you know what? That is ok. When the thought first occurred to me, I was like, “oh no, maybe I’m not the awesome and talented individual that I thought I was.” In pretty much every other situation, if you give me some starting loose ideas for an event and I will RUN with it and come up with a million and a half amazing ideas for it. EXCEPT for the creepy stuff. I don’t personally watch horror movies, I’ve never been to any haunted mansions, or scare parks, and I’m totally ok with that. At one point, I thought that Halloween was just useless for me since I wasn’t really “into” the scary scene. But as it turns out there are TONS of other avenues! So I will be continuing to share with you MY interpretations and ideas for not-so-scary Halloween party ideas. 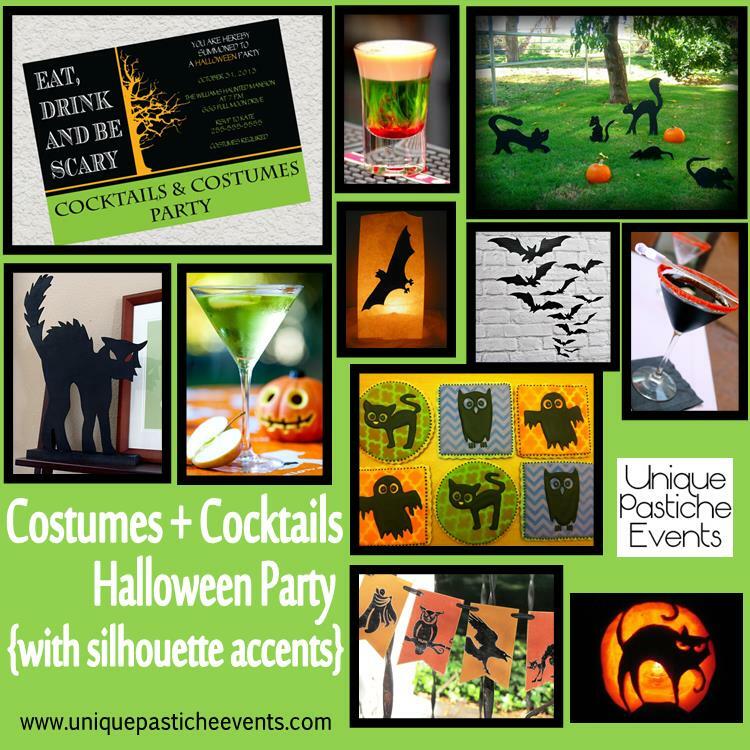 This week’s inspiration board is for a Costumes and Cocktails party. Simple, easy and NOT creepy, woot! I kept the focus of the details on black silhouettes. The reasoning behind this is to have décor without having HEAVY décor, and that way, when everyone comes dressed up in smashing costumes, the silhouettes will serve as excellent accents, and keep the focus on your guests and their costumes. Booze – and lots of it! Try finding 2-3 signature drinks that have a Halloween twist. Music – there are a bajillion (that many!) Halloween cd’s out there. Theme music is a must for this type of party. Lighting – keep it on “low glow” for optimal impact. There’s nothing in the shadows, right? If you could dress up as ANYTHING right now for a costume party, what would it be?